In scripture we remember Peter addressing Jesus on Mount Tabor, “Lord it is good for us to be here”. Olivia today it is good for us to be here with you, to honour and celebrate your commitment and devotion to the call that the Lord has carved out for you in life. We know that your response is the result of prayer, discernment and reflection over many years. It is a decision carved out in a carefully crafted response deeply echoed in the story of your faith journey and pilgrimage of life. From the beginning of time, God has used people as his instruments. From the call of Adam and Eve, Abraham, Moses, the prophets, the call of Mary in today’s Gospel, the disciples, Paul and the multitude that have responded down through the centuries. Today Olivia like Samuel you have heard the voice of God and recognised it and said over and over again with an open heart, “speak Lord for your servant is listening”. And in reply you have heard Jesus’ words, as recorded in John’s Gospel, As the Father has loved me, so I love you, I tell you this so that my joy be in you and your joy might be complete. I call you friend. Olivia, friend sums up your relationship with the Lord. It was fostered in the Kelly household down through the years, shared in words and actions as you grew into the world. Today we are giving thanks for Frances your mum, your dad Francis who is very much with us in spirit, brothers Fergal, Greg, Francis and sister Edel and the wide family that makes up the Kelly circle. The close bond that makes up the Kelly family is at the very heart of the Christian message. It is real, wholesome and precious, for the gift of faith and the vocations we are honouring this morning does not come from a world of isolation. It is born from a family of faith and love, explored and dissected in a safe and affirming environment. Love is what you have for life Olivia. It was evident in your family, work and friends. It was evident in your actions and decision that you made each day in this world, shaped and formed by prayer, Mass and Adoration. It was and is evident in your ability to always see the best in people and in the world. On the many youth pilgrimages among other events with St. Michael’s Youth Prayer Group down through the years you were the guiding light, the bright spark, the one who persevered. I remember you reminding one man who was complaining about the food on pilgrimage, that it was not a holiday camp, but a pilgrimage and on another occasion reminding some young people to stop dossing and get with the programme. Of course all this was tapered with the customary warmth and compassion of Olivia. There were times also, dare I say, that I could have strangled you, especially when I asked you to take charge of the confectionary shop at a Youth retreat and you put up a sign saying please leave your money here and when off chatting. I also remember the day you invited some of us up to your home for breakfast after Sunday Mass, and when we all arrived at the door, much to the surprise of Frances, Olivia was nowhere to be found. She had disappeared to help someone in need. But be it family, person, friend, companion, organiser, supporter, taxi person, faith developer, parish worker and all round achiever, Olivia you were always giving and sharing your gifts. 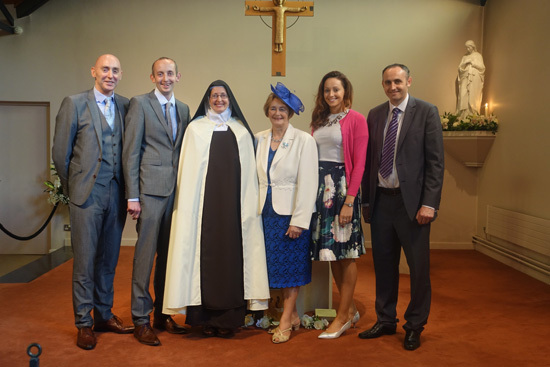 It is because of this generosity of heart, the living out of true Gospel values that the wider Community do and will continue to miss your presence. Olivia this morning we are honouring your response to the Lord. In modern Ireland your life in an enclosed order under the vows of poverty, chastity and obedience is admittedly extra-ordinary and extraordinary. Your life calls for a special grace from God that enables you to live more freely and more intensely the Christian life. As Vocations Director in our Diocese I know that commitments for life in our society comes hard. Our culture is not very supportive of life-long commitments to anything. Ireland today and indeed much of the world is instant and quick or it has no value. We prefer to try this and that and if we don’t like it, we move onto something new. Olivia what you are doing today is counter-cultural. Living as you do in a culture that is progressively more intolerant of religious values and that gives God less space, it is difficult to be different. You are out of the ordinary, in other words you are extraordinary. It is because of this and the fact that you have touched the hearts of so many people down through the years, that your call to this way of life has caused many to pause and ponder. Of course you haven’t leaped into this mode of life quickly, without careful deliberation and preparation. You have prayed over your decision, you have listened to the hand of God at work in your life through the guidance of your spiritual director and this Community. You have searched and explored, examined and reflected, constantly seeking clarity and vision on your individual call in life, reflected in the heart of the Lord and the light of the Gospel. 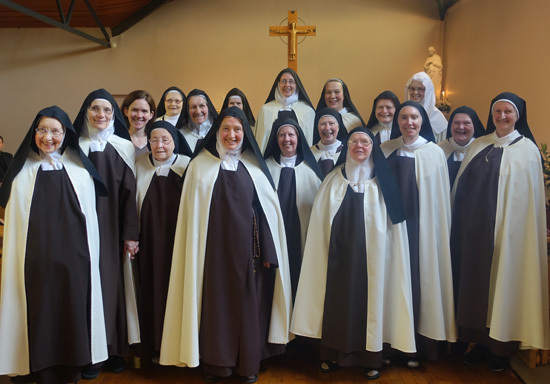 And today this community, all of you, sisters under the guidance of Sr. Maura and Novice mistress Sr. Josephine are affirming your decision, Olivia, to join this community as a full member. Each of you have seen the value of allowing this lively spark enter into the inner sanctum of your community. You too since 2010 have nurtured Olivia’s vocation, her faith, gifts and many talents. In action and words Olivia, today you are affirmed as a full member of the Carmelite community, sharing all things in common now and in the future. I have no doubt that the many talents and gifts that you clearly displayed in the world will enhance this community. Here today you have found your home. It is evident that you have found a deep peace and happiness within these walls. Here your soul is at rest. It is not the end of the road for as we live we grow and experience new events, but that is for another day. For those who may wonder, who may question, they only have to spend a short time in your presence and the answer will be obvious. Olivia today we congratulate you. Your family and friends who have gathered today and who will gather in the days ahead are praying for you. Your home Parish of Carraroe is remembering you with great affection and fondness. May Mary walk with you and guide you to her Son as your model and intercessor. May she help you to be faithful always in your life and lifestyle to the vows you are making today. May the hand of God continue to guide and direct you through the wisdom and knowledge of this Community in the days and years ahead.